Recent remarks by several senior Pakistani officials suggest that Pakistan and China are groping with how to deal with globally designated Pakistani militant Hafez Saeed as the South Asian nation gears up for elections expected in July and risks being next month put on an international terrorism finance and money laundering watchlist. The Pakistani-Chinese dilemma stems from a China-backed Pakistani refusal to fully implement designations of Hafez Saeed by the United Nations Security Council and the US Treasury. 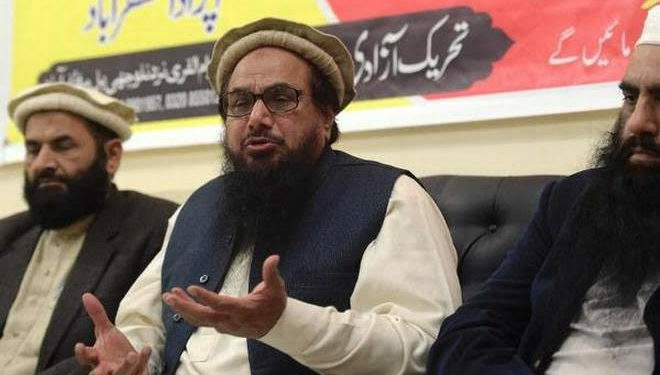 The United States has put a $10 million bounty on the head of Mr. Saeed, who is believed to lead the outlawed militant group, Lashkar-e-Taiba (LeT) as well as Jamaat-ud-Dawa, an alleged LeT front, and is suspected of being the mastermind of the 2008 Mumbai attacks in which 166 people were killed. Pakistan has repeatedly put Mr. Saaed under house arrest, only to release him on court orders that asserted that there was insufficient evidence against him. The government has half-heartedly sought to seize Jamaat-ud-Dawa assets and prevent it from collecting donations through its charity arm, Falah-i-Insaniat Foundation. Pakistan’s election commission has so far refused to register a political party established by Jamaat-ud-Dawa in advance of the elections. The refusal would not prevent party members from running as independents. To reduce focus on Mr. Saaed, a senior aide to Pakistani Prime Minister Shahid Khaqan Abbasi said that Chinese President Xi Jinping had asked Mr. Abbasi during a meeting on the side lines of last month’s Boao Forum to explore relocating Mr. Saaed to a Middle Eastern country. “At a 35-minute meeting, at least 10 minutes of the discussion dealt with Saeed. The Chinese President was keen on pressing the Prime Minister to find an early solution to keep Saeed away from the limelight,” The Hindu quoted the aide as saying. The divergent proposals to either remove Mr. Saeed from the limelight or mainstream him by integrating him into the political process are unlikely to satisfy either the United Nations or the United States. They are also unlikely to prevent the Financial Action Task Force (FATF), a global financial watchdog that monitors the funding of political violence and money laundering, from next month putting Pakistan on its watchlist. Mr. Xi’s suggestion to Mr. Abbasi reflects Chinese ambivalence towards those Pakistani militants that both Islamabad and Beijing see as useful tools to keep India off balance. China protected Mr. Saeed from UN designation prior to the Mumbai attacks and has since prevented another Pakistani militant, Masood Azhar, from being designated by the Security Council. At the same time, China refrained in February from shielding Pakistan from censorship by FATF. Implementing Mr. Xi’s proposal to remove Mr. Saeed from the limelight is easier said than done. Its hard to see what Middle Eastern nation would risk international criticism by granting Mr. Saeed asylum without tacit approval by the United States and/or the United Nations. By the same token, its unlikely that either would agree to the scheme. Similarly, neither the UN nor the United States are likely to be persuaded by a belief within the Pakistani military that the best way of blunting militancy that has over the decades been woven into the fabric of significant segments of the armed forces, intelligence and society is by mainstreaming militants and integrating them into the political process. Ousted Pakistani prime minister Nawaz Sharif kicked up a storm when he earlier this month appeared to confirm the pervasiveness of militancy bysuggesting that the perpetrators of the Mumbai attacks had been supported by Pakistan. “Militant organisations are active. Call them non-state actors, should we allow them to cross the border and kill 150 people in Mumbai? Explain it to me. Why can’t we complete the trial? It’s unacceptable. This is exactly what we are struggling for. President Putin has said it. President Xi has said it. We could have already been at seven per cent growth (in GDP), but we are not,” Mr. Sharif said. The remarks by the Pakistani officials suggest that both Pakistan and China are attempting to square circles. Pakistan needs to be seen as cracking down on militancy while considering the domestic influence of ultra-conservative religious groups as well as seemingly misguided beliefs that support for anti-Indian militants serves its purpose. For its part, China’s justification of its hardhanded crackdown in the north-western province of Xinjiang as a bid to counter jihadism and nationalism among, Uighurs, a Turkic people, is weakened by its reluctance to be equally firm in countering militants in Pakistan. The problem for both countries is that 1 + 1 = 2, whichever way one looks at it.